Page Street Publishing, 9781624144868, 192pp. For a wholesome, complete meal in just one bowl, look no further than Nourishing Superfood Bowls. Packed with superfoods and flavorful combinations of grains, proteins and vegetables, these casual and comforting dishes are quick and easy to prepare, and provide gluten-free, balanced nutrition. Perfect for breakfast, lunch, dinner or dessert, you can quickly energize your day from morning to night with fresh, real food ingredients. Whether you’re looking to clean up your diet, refuel after a hard workout or follow any type of diet, there’s a deliciously convenient bowl for you. The innovative and restorative recipes are gluten-free and allergy friendly, with vegan, vegetarian and Paleo options. 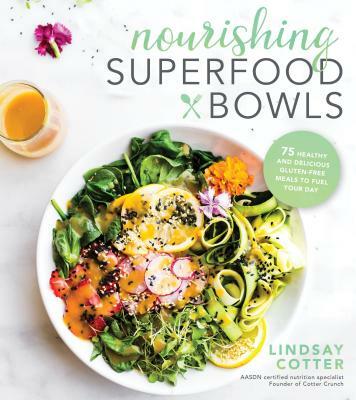 Featuring 75 mouthwatering recipes like Blueberry Coconut Rice Porridge Bowls, Kickin’ Orange Chicken and Broccoli Rice Bowls, Loaded Sweet Potato Nacho Salad Bowls and Baja Fish Taco Bowls, there are endless ways to combine your favorite ingredients for a clever and tasty feast. Lindsay Cotter is a Nutrition Specialist for sport nutrition and gluten-free eating. She is AASDN certified and the founder of the blog Cotter Crunch. Lindsay has been featured on many popular health websites and magazines including Dr. Axe, Shape magazine, Fitness magazine, Men’s Health and more. She lives in Austin, Texas, with her husband and chocolate lab.